Possibly the best falafel in the city hides at Ray’s in Burnside. Munch on fantastic combo plates, vegetarian dishes, chicken and beef pitas, rice and more. Top it all off with a homemade piece of baklava and you’ve got yourself an affordable meal. 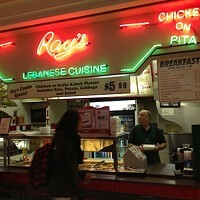 Possibly the best falafel in the city hides at Ray’s in the Scotia Square food court. Munch on fantastic combo plates, vegetarian dishes, chicken and beef pitas, rice and more. Top it all off with a homemade piece of baklava and you’ve got yourself an affordable meal to fuel your shopping trip. What was once the best mall food court in Canada is being systematically dismembered.